By now we’ve all heard the biggest news of 2017, fated in the heavens for eons before humanity’s earliest ancestors walked the savannahs: There’s an eclipse this August 21st, and it’s carving a path right through these great United States of America. GO GET IT NERDS. Being both a meteorologist and an astronomy buff, and (quite frankly) a human being that relishes in once-in-a-lifetime soul-shattering experiences, I whipped out Microsoft Excel to try to answer the first question that came to mind when a few friends and I were planning our road trip target to the centerline of the eclipse. Factoring in clouds, where is the best place to go that maximizes our chances of seeing this spectacle? I couldn’t find a single source on the internet that answered this most crucial of queries. So, I dug into it myself. Canadian meteorologist and self-proclaimed “eclipsophile” Jay Anderson offers a comprehensive resource for the historical cloud cover along the eclipse swath—the path the moon’s shadow will take across the Earth’s surface—using a 17-year database of weather satellite records, complete with satellite photos of August 21sts of the recent past. Anderson masterfully explains the meteorology of why certain places along the eclipse path might or might not have clouds that day—for example, at around 10:30 am local time, in the lee of the Cascade mountains, typical summer thunderstorms haven’t yet had a chance to bubble up, increasing the likelihood of clear skies. But there’s no simple, straightforward “just tell me where to go” chart that makes his superb knowledge easy to grok. Best I could find was the simple table at the bottom of this site, eclipse2017.org (itself a pretty great resource), that uses Anderson’s data for a sampling of cities across the country. 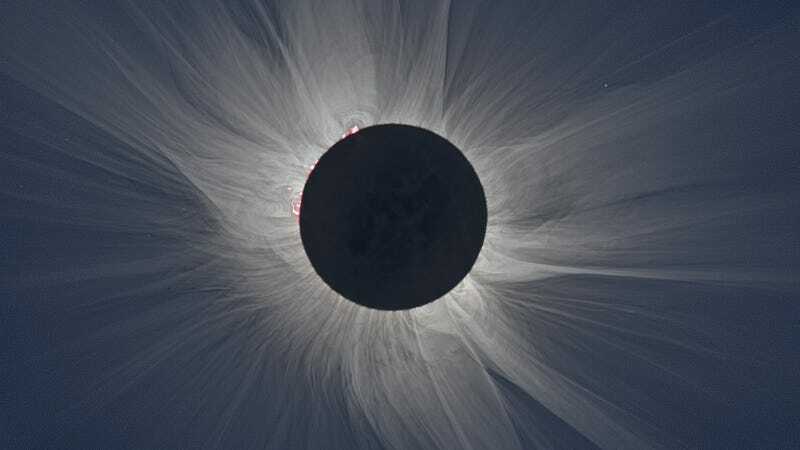 But more so than just knowing which places have the best chance of being clear and which places have the best chances of being cloudy, we need to know where the eclipse will be eclipsing for the longest amount of time with the best chance of clear skies. As the moon’s shadow travels from Oregon to South Carolina at supersonic speeds, the quirks of celestial geometry mean that the shadow will linger over any given place a bit longer the closer you are to this spot in southern Illinois. At the western extreme, on the beach near Newport, Oregon, the eclipse will last exactly two minutes. In southern Illinois, that stretches out to two minutes and 41.6 seconds, nearly 35 percent longer. So, I’d want to be in Illinois if there’s a good chance the sky will be clear. But as it turns out, Illinois is probably not the best place to view the eclipse. Factoring in clouds and the duration of the eclipse itself, there are two spots that emerge as clearly the prime places to be on shadow day: eastern Idaho and western Nebraska. The brief seconds of totality will take place between 10 am and 2 pm, local time, depending on where you are. (This 10-foot map tells you exact times for your location.) The location with historically the fewest clouds around mid-day on August 21st is actually Boise, Idaho, but factoring in the longer eclipse in the eastern part of the state, positioning yourself about 100 miles north of Pocatello, Idaho near the town of Rexburg might be the best place in the whole country to maximize your eclipse experience. (Of course, the good people in Rexburg already know this, and have a whole website devoted to recruiting you to come there that day.) There happens to be a road that goes right along the eclipse centerline, Idaho State Highway 33, that should offer lots of good places to put your body. The only problem with Rexburg is that the surrounding mountains make for relatively complex and unpredictable weather. Even if the odds are in your favor, one of those pesky summer thunderstorms could pop up and obscure the sky within minutes—and you’d be royally screwed. If clouds cover Highway 33, you’ll miss the eclipse. So instead, my friends and I have decided to drive to Nebraska. Factoring in the slightly greater chance of clouds over the last 17 years but longer eclipse duration than Idaho, we’re sacrificing just a second and a half of eclipse-watching time for a much better road network, and the piece of mind that the sky has been completely cloud-free each of the last six years. Nebraska is super boring, in fact, probably the most boring place in America. The whole “eclipse” thing seems to have caught the region off guard. “All of the scientific-type people have had their plans in place for over two years,” is an actual quote from Karla Niedan-Streeks, the executive director of the local convention and visitor’s bureau. “We don’t want people to be bored,” is another actual quote (from the same amazing local news story) from someone in the most boring part of the most boring state in the country working to plan events for eclipse day. They probably didn’t expect a Gizmodo article directing every able-bodied nerd to their tiny town, now did they? But there’s a certain appeal to being out in the middle of a featureless plain (almost assuredly alone) to witness one of the most eternal and cosmic displays that exists in nature. For a moment, even, you might feel like the only person in the whole universe. And that’s pretty wow. So look out Scottsbluff, Nebraska, here we come. Eric Holthaus is a meteorologist and freelance writer on weather and climate change.